Conversion of weights and measures can some times be tricky and a real pain sometimes when converting American or Australian recipes to European (and vice versa), especially since not many realize their cup and tablespoon measurements are different. Here is a quick reference on them, as well as conversions for oven temperatures. I shall keep this post on my side bar for easy reference. Things get worse in Greece where our measurements are not very precise. The traditional recipes given by mother to daughter say some salt, little pepper, some rice, some parsley, a handful of that, a glass of this or a tea cup of that etc., and we have practically learnt cooking by experience. 1 glass of milk is 200 grams, sugar is 215 grams and flour is 130 grams. However, the glass is not filled to the rim. I will try from now on to be more specific in my recipes and especially in baking. I am cooking and baking my recipes again and shall try and update all the recipes which were posted before November, 2008. 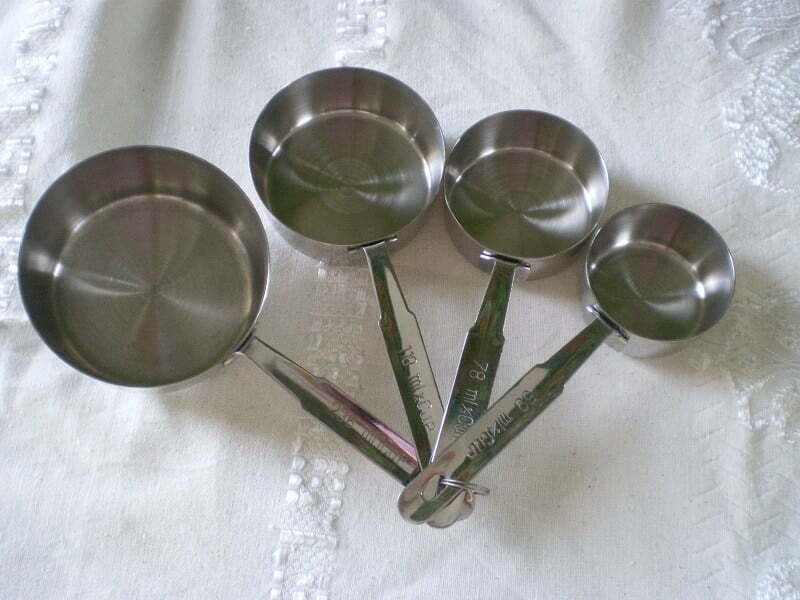 From now on, I shall be using either cups or grams, or tbsp or tsp, which are the ones shown below. Personally I also have problems converting butter measurements and I am sure that others as well will have similar problems so according to some measurements I have found on the internet, I shall use these as a guideline for my recipes. Note: If a recipe calls for a pinch of something, this is what you can pinch using your three fingers. = 1/4 oz, about 7 grams. = 3 or 3 1/2 (2-gram) sheets. 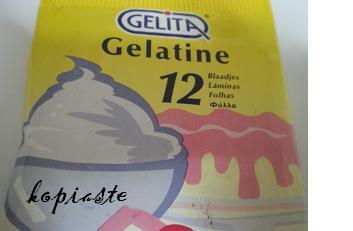 Note: for 1 litre of liquid I use 12 sheets of gelatine or 2 sachets equivalent to 2 tablespoons (20 grams) gelatine powder. This should be a very useful post for everyone IVY! Very good information Ivy! Thanks. Thank you ivy you are right some times it gets too complicated ! Viva i grammi ! Yes, Ivy, you are so right! I always have to Google different measurements. Thanks for this handy-dandy reference. Great idea! back home in Indonesia, at old times, my mother usually measured using glasses or tumblers. her recipe collection is full of recipe using this measurement. it is me who’s got the job to convert them now hehehe… very informative post you’ve got here, ivy. thanks heaps! Great post Ivy, this will be very useful! I look this up on google all the time. Bookmarked. Thanks. This is very useful; I use the sweet and simple bakes conversion chart. Would you believe it took me forever to realise that the US stick of butter was almost half the size of my stick of butter (250g or 227g depending on brand)? You can imagine the initial baking disasters and confusion before I caught on. Ivy thankyou for the info, i am going to print out this post and keep in my kitchen. It is always a disaster with me when it come to measurement. I always use grams or ml measurement, but then when i look to american blogs or books it is cups. I posted your cheesey snack and i have got lots of wonderful feedbacks from it. Oh, this is so useful!! I have a rubric on my blog called “conversions/substitutions” in which I talk about this same problem. I highly recommend this website too: http://www.onlineconversion.com/cooking.htm. It’s very thorough! I’m getting an intuitive sense now of the conversions and don’t have too much trouble when I’m baking, but when you want to share a recipe, that’s a different story! A great helpful post, Ivy. I’m always confused with the US butter measurements coz they tend to measure in stick, cup or tablespoon. I’ve bookmarked it for future reference and thanks a lot! how did you ever figure out when these Greek recipes, exp-1 cup butter (water glass)????? thanks for passing by my blog and leaving such wonderful encouraging words..it helps and thank you. I feel happy with this post as at any time if i require information on measurement, i know where to go quickly..well summarised. Ivy, this is so wonderful of you to put this information here. Only today I was struggling with such measurement conversions. I do have some links, but do you mind if I link to your post in my blog? You are so right about it, it isn’t easy at all. This will surely be of help. Conversions can sometimnes deter me from recreating a dish in my own kitchen sis. I always fibd myself googling. I had a question about what 130 grams of puff pastry was which to me is 1/4 of a package but I had to Google it. You have no idea how helpful this is. I’m constantly avoiding making some recipes because of the conversion. Even Psychgrad and I often speak different measurement languages – I still think Imperial and PG thinks Metric. What an incredibly wonderful thing you did in posting this. Great job, Ivy! Thanks for this Ivy – it is very handy. Ivy, I find Lore’s ‘Culiverter’ to be quite helpful when it comes to sorting out and converting measurements, but thanks for your valuable input on this matter. I am bookmarking this important post! thank you!!! I am very glad that this post might be also helpful for you all. Lore’s Culiverter is still very useful and I do use it whenever necessary but this is quite different having all these measurements in one post. So if you have something I can add to the post, please let me know. Your measurement page is ingenius … esp the butter and gelatine part. May I link this page? First of all I would like to say great blog! Thanks for sharing this amazing and informative article. Thank you ivy you are right some periods it gets too complicated.